Several months back, Canon held an event at their Hollywood HQ showcasing their complete line of Cinema Eos products, but focused on (pun intended) their cinema lenses. There were a couple of speakers; one ,who’s name escapes me at the time of writing this, coming from a new-age cinematographers point of view talking about the benefits of modern image sensor technology and compact, lightweight style shooting – and the other, Larry Thorpe. If you’re not familiar with Larry Thorpe, he’s basically a guru of all things image acquisition. He’s worked for RCA, Sony, and now Canon. One may jump to the conclusion that he loves Canon lenses so much simply because it’s his job being a marketing exec. at Canon… But Larry is truly passionate about his work and optics in particular and it shows. Larry’s presentation at the Canon event revolved mainly around optics and discussed current and future technologies. Canon released a PDF which essentially mirrors Larry’s presentation at the event that I’ve linked here. Give it a read and see why Canon is making waves in the industry with their cinema optics. See the PDF below. I really appreciate you taking the time to keep us all educated. I’m sure many others do too. Hey, John? Do you mean the TK-76? It would be ironic if RCA and Kalashnikov conflated their product designations! 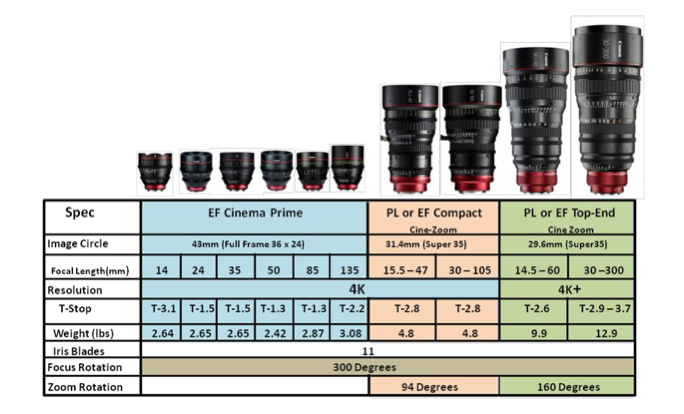 Fascinating stuff here about the Canon Cine Prime lenses. Previous Previous post: It’s Coming! The New Zeiss 55mm f/1.4… Otus?